The DSPP Arts Committee was created in 1996 by Judith Samson, Ph.D. The idea emerged while she was serving on the Community Relations Committee. Her intent was to engage interested DSPP members in a variety of artistic activities and explore the psychological/psychoanalytic underpinnings. The artistic spheres have included cinematic, performance, literary and studio arts, and participation has always provided a rich environment for fun, connection, and discussion. The Arts Committee is devoted to enriching life experience through increasing the appreciation, interpretation, and comprehension of artistic personalities and the meaning of their creative expression from a psychoanalytic perspective. As Pablo Picasso stated, "The artist is a receptacle for emotions that come from all over the place...from the sky, from the earth, from a scrap of paper, from a spider's web." Art stirs internal responses and evokes questions that arouse a desire in us to understand those feelings and questions. What is an artist trying to express? What needs of the artist are being met through creative expression? Is art, without the limitation of words, a truer expression of human feelings? Does expression assuage emotional response or resonance in the viewers or audience? Is art a truer expression of human capacities and desire without the impediments of intellectualizations that can betray the heart? 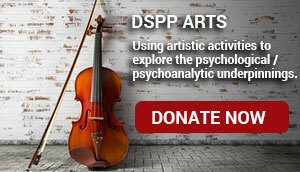 The DSPP Arts program will enhance our lives and our life stories, and nurture our aesthetic experiences. The beauty of art reaches deeply into the human heart and mind, and takes on an importance in human and professional development. Hence, DSPP is committed to providing artistic experiences to members, colleagues, and friends. Ayaz H. Malik, M.D., and Saadia Khalil, M.D. As we commemorate this year's 15th anniversary of 9/11 and feel for those who lost loved ones, we also want to be aware of an additional consequence in the wake of those events: The challenges innocent people of Muslim faith and Middle Eastern or South Asian origin can still face when living in America. What does it mean to be 'pegged', type-cast, viewed as a 'representative' of a people and faith that has come under increased scrutiny based on radicalized political action of a minority within that community? What gets sacrificed when a rich culture and tradition of wisdom, knowledge, and beauty gets overshadowed - if not drowned out, by political discourse? What is the 'price' to be paid for living in the (American) West? Has the price increased post 9/11? How can we understand each other as living in a shared space while still respecting each others' differences and unique cultural and religious traditions? These are but a few questions we may ask as part of our discussion and our efforts to learn more about Muslim cultures and lives, as we meet each other inside and out of the therapy room. Ayaz Malik, M.D. is a practicing neurosurgeon who as a special interest has accumulated significant knowledge of Muslim culture and traditions and their challenges at the crossroads of modernity and the values of the West. I have found him to exhibit a keen interest and ability for tackling some of the more difficult questions our post 9/11 times might present for us. He will also be a great resource to us for hints and pointers re relevant literature (fiction as well as non-fiction) and films of interest to pursue for added exposure and learning about the rich history of Muslim traditions. Saadia Khalil, M.D., is a world traveler and equally at home on American soil as she is in her Muslim Pakistani homeland. She has worked in Asia, Europe and the US, in the corporate setting (project management and clinical trials) as well as an independent consultant. In the process, she became particularly attuned to and in touch with the ongoing changes among various (sub)cultures in East and West and found a way herself to merge the best parts of both worlds. Moreover, she has recently changed career paths to indulge her life long passion for art, and is now bringing to the US a highly curated selection of fine art from Pakistan, hoping to offer her audience a different view of her country and cultural heritage, one that is more positive and hopeful. CEU's: 3 Diversity/Ethics credits for members. $30 for non-members. RSVP for directions and bring a dish and/or wine for our Potluck. For a pre-Valentine's treat, we welcome the Oak Cliff musicians Lisa Markley and Bruce Balmer to sing, play, and talk to us about their music and how their joint passion has influenced their marital relationship and, in turn, how they may have drawn inspiration from their relationship for their music. Lisa Markley has been recording and touring over the last fifteen years as a singer-songwriter and jazz artist, playing shows in various major festivals, such as the Festival Memoire et Racines in Quebec, the New Orleans Jazz and Heritage Festival and the Kerrville Folk Festival. She also performed in jazz clubs in Seattle to folk clubs in Boston, and in “house concerts” from Cape Cod to Denver to New York City. Though most often recognized for her abilities as a vocalist, Lisa is also a multi-instrumentalist, playing the guitar, piano, banjo, and trombone. Markley is a graduate of the reknowned School of Music at University of North Texas where she performed in the lab bands and in the NTSU/UNT Jazz Singers. Bruce Balmer is a guitarist and singer-songwriter who has been writing, performing and recording many original songs, playing lead guitar for rock, jazz, and country bands, and composing for dance performance and for film. He was also involved in the vibrant underground folk scene in NYC and the Greenwich Village Songwriter's Collective and was on road tours with the late Jack Hardy. More recently he has been performing both, with his wife Lisa Markley, as well as solo and released two solo albums "Upstream" and "Get Outta Park". Featuring: Marty Lumpkin, Ph.D., Robert Aberg, Ph.D. & Sarah Aberg, LCSW. DSPP Arts goes 'into the wild' again for an afternoon of colleagual outdoorsy fun activities on the shores of Lewisville Lake, courtesy of Daria Dato, LCSW, who will kindly host us again in Shady Shores. We'll be starting with a comfy short hike, during which we can muse about the finer things (secret tip: I have overheard some of the best conversations and discussions during our last hike). This should help work up an appetite for the barbecue indulgence, to be followed by a mind & body 'cleansing' movement meditation of Qigong with Marty Lumpkin, Ph.D. Qigong is an ancient precursor to Tai-Chi and Marty Lumpkin is well known at UTSW and beyond for his teaching of mindfulness practice classes. He has also published a well-received book on mindfulness: Into the Music of the World: Living Life Mindfully, that helps bring Buddhist practices into everyday life. Finally, our beloved musician members Robert and Sarah Aberg will round out the afternoon with some fabulous tunes and throw in a couple of sing-alongs (bring your best voice - and a portable rhythm or other instrument, if you like). This time in April it should be a bit cooler than last time around: so buckle up again for the short drive and see you in Shady Shores. RSVP directly to daria.dato@gmail.com for directions and on-site information. BYOB and a side dish, salad, or dessert for our barbecue. Our ever so popular Annual Soiree and Talent Show provides an opportunity for local members and spouses or friends to share their musical or other artistic passion with our DSPP community. This year's program features also the celebrated concert pianist John Bayless as well as our cherished Austin colleagues Ricardo and Daphny Ainslie. Thanks to the special connections and dedicated efforts of Denise Humphrey, Ph.D., and Susan Roos, Ph.D., we will be able to enjoy these special guest performances along our own talents. Denise Humphrey has been our long-time organizer and coordinator of the Soiree - please contact her directly if you are interested in contributing a live performance. All are welcome to attend and bring spouses or friends to this enjoyable gathering. Special thanks also to Marc Litle, M.D., for offering again his lovely home as our host location. John Bayless has made a name for himself as an extraordinary pianist and gifted crossover artist who blends classical training and piano technique with popular and film music in dashing and imaginative improvisations. His "Bach Meets the Beatles" and "Bach on Abbey Road" were popular hits, the former being one of Billboard's Top Ten crossover albums of the 1980's. The "Puccini Album - Arias for Piano" was at the top of the classical crossover chart for eighteen weeks. He also scored hits with his variations on songs from Bernstein's West Side Story and a set of classical film scores. Bayless has been touring widely across the globe, playing around fifty concerts a year and has been commissioned as a composer for music festivals, piano competitions, and film scores. He has made appearances at major venues such as Carnegie Hall and Lincoln Center and performed with numerous orchestras, including the New York Philharmonic Orchestra, the Cleveland Orchestra, the London Symphony Orchestra, the Royal Liverpool Philharmonic Orchestra, the Philadelphia Orchestra, and San Francisco Symphony Orchestra. He has been immensely appreciated for both his pop as well as classical interpretations within his ever growing repertoire. Bayless has previously performed for us in a concert venue at SMU - the event was a resounding success. In summer of 2008, Bayless suffered a mild stroke and lost the use of his right hand, yet this didn't deter him from continuing his play and he still brings magic to the piano with only one hand. We are fortunate and grateful to welcome him back again to Dallas and to our group. Ricardo Ainslie, Ph.D. is the M.K. Hague Centennial Professor in Education at UT Austin and a psychoanalyst who is well known for his interdisciplinary work and hybrid methodology of "psychoanalytic ethnography" in a variety of media, including documentary film, photographic exhibits, and books - all in the service of fostering public reflection. Some of the themes and projects he has worked on include hate crimes and racial violence, Mexican drug wars and community violence, Veteran issues, and Latino/a immigration. With his psychoanalytic ethnography he has thus taken his work out of the consulting room and into communities where he explores these difficult and often traumatizing events. Over the years, Ainslie has earned numerous honors and awards for his deeply moving and sociopolitically significant work. Ricardo and his wife Daphny Ainslie have previously attended one of our Soirees and contributed with their musical talent to our program. We are happy to have them back again. Scott Churchill, Ph.D., and John Sadler, M.D. Augustine is a historical drama about early French diagnosis and treatment of hysteria in the documented case of Augustine by the famous neurologist Jean-Martin Charcot. This drama is not only beautifully filmed and exquisitely acted, it is also of interest, both with regards to the history of diagnosing and objectification of patients, as well as the portrayal of doctor-patient relationships in the movies. There will be plenty of value issues and the vagaries of (repressed) desire for us to discuss - notwithstanding that the fictional case of Augustine (in the film) deviates in some essential respects from the historical case of Augustine. Scott Churchill, Ph.D., is a professor of psychology and film studies at University of Dallas and is widely published in the field of phenomenological and humanistic psychology. In his teaching he highlights the philosophical-existential and psychoanalytic heritage of psychology and is known to work from historical source materials, not just text books - meaning his students actually read Freud, Erikson, Horney, and so forth! He is also well known for his phenomenological studies of communication with bonobos and he serves as editor-in-chief of the APA journal The Humanistic Psychologist. John Sadler, M.D., is a clinical and philosophical professor of psychiatry and director of the Science & Medicine Ethics Program at UTSW. He is the author of numerous philosophical and ethical studies in psychiatry and especially known for his major work of Values and Psychiatric Diagnosis (among others). He is the principal agent of a critical and value-sensitive psychiatry in the US and has greatly contributed to putting this 'humanized' psychiatry on the map, here as well as abroad. He serves together with K. W. M. Fulford as editor of the interdisciplinary journal Philosophy, Psychiatry, & Psychology.